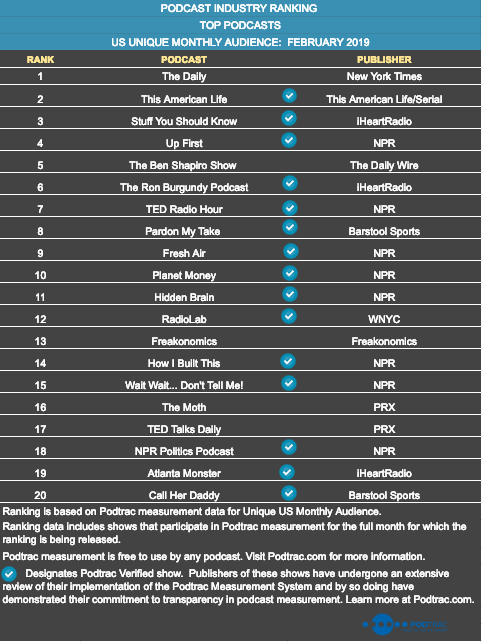 Podtrac's ranking of the Top 20 Podcasts based on U.S. Unique Monthly Audience for March 2019 is now available at Podtrac.com. What content is driving the imaginations of publishers and capturing the attention of listeners? Turns out it’s Comedy, News & Politics and Society & Culture... by a long shot. Comedy, News & Politics and Society & Culture made the top 3 in both years. Each top 3 category has a top show average audience over 1.5 million listeners. The 4th largest top show average audience (Business) - is just over half the audience of the # 3 category while the #5 category, Arts, is just ⅓ of the #3 category. When ranked based on absolute overall average per show audience growth, the same three categories win, but News & Politics comes in #1, followed by Comedy and then Society & Culture. Religion & Spirituality had the largest percentage audience increase (though ranked 6th in absolute audience growth), followed by TV & Film (7th in absolute) and Comedy (2nd in absolute). News & Politics had the largest absolute audience growth (while ranking 6th in percentage growth) followed by Comedy (3rd in percent growth) and Society & Culture (10th in percentage growth). Sports & Recreation had the lowest percentage audience increase or 8% (13th in absolute audience growth) while ranking 6th in show growth (63%). Business had the largest percentage increase in number of shows in the category (77%), followed by Games & Hobbies (75%) and Health (71%). News & Politics had the lowest percentage growth in new shows (40%) but the largest absolute growth in audience. Here’s the February 2019 Category Ranking. Podtrac's ranking of the Top 20 Podcasts based on U.S. 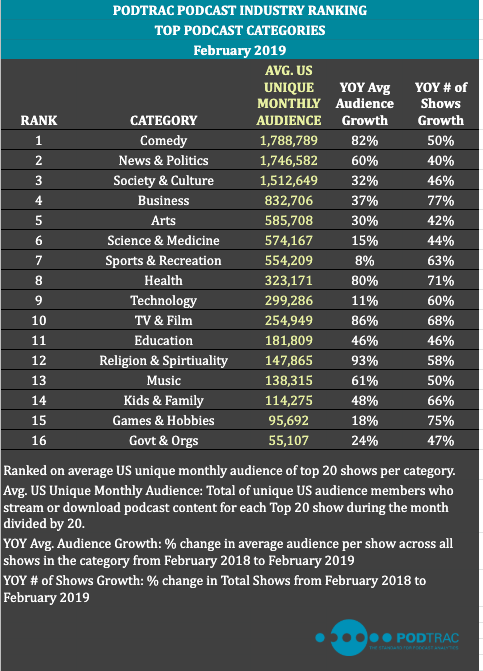 Unique Monthly Audience for February 2019 is now available at Podtrac.com. The Top 10 Podcast Publishers ranking for February 2019 is now available at Podtrac.com. Nine of the Top 10 publishers showed increases in their US Unique Monthly Audience (UMA) over January with the biggest increases coming from The Daily Wire and Wondery — both at 17%. Year-over-year, iHeart showed the greatest increase in US UMA (311%) reaping the benefits of the HSW acquisition and new programming, while Wondery had the second largest gain (155%) on the strength of new programming. Average US Unique Monthly Audience across the Top 10 publishers of 8.1 million is up 6% from January 2019 and up 42% from February of 2018. Last week we published our Top 10 Podcast Publishers ranking for January without Global Unique Download numbers and asked for your feedback. In response to that feedback, we’re publishing a revised version of the ranking with the Global Unique Download numbers added back. The Top 10 Podcast Publishers ranking and the Top 20 Podcasts ranking for January 2019 are now available at Podtrac.com. Five of the Top 10 publishers showed increases in their US Unique Monthly Audience with the biggest increases coming from The Daily Wire (19%) and iHeart (15%). Average US Unique Monthly Audience across the Top 10 publishers of 7.7 million is flat from December and up 29% from January of 2018. Total Global Downloads for the Top 10 Publishers increased by 15 % in January from December bouncing back from the year-end seasonal slump. Total Global Downloads for the Top 10 Publishers is up 57% from January 2018. We’d love your feedback and input on the rankings. Take this 5 minute survey to tell us what you think. 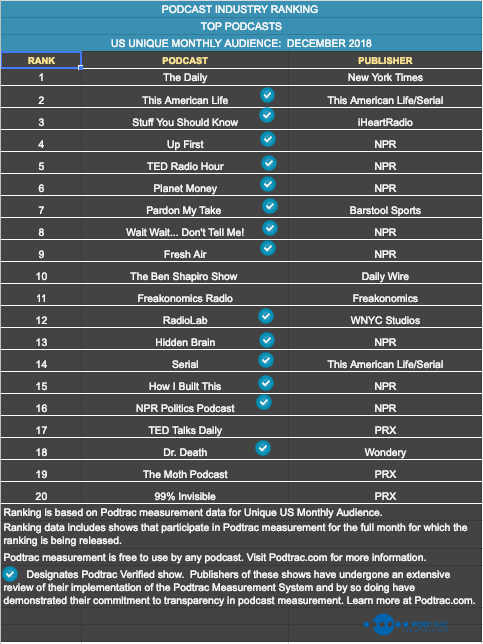 Podtrac's ranking of the Top 20 Podcasts based on U.S. Unique Monthly Audience for December 2018 is now available at Podtrac.com.